Milan has the most consistently, classicly elegant men in the world. This is not necessarily a good thing. Many, in the fashion industry in particular, criticise Milanese men for a conservatism that is dull and impersonal. They all dress the same; they all dress like their fathers; they all wear the same goddamn blue tie. Britain, for all its history, does not have this. The establishment is less conservative, less cohesive and less interested in clothes. Advocates praise British eccentricity and creativity – perhaps demonstrated by Paul Smith. And to a young man growing up in Milan it’s easy to see how that would be a breath of fresh air. But to those of us outside Milan, and passionate about classic men’s style, the gentlemen of that city are an inspiration. Here are some observations from a few days spent there last week. The strength of colours stands out immediately. Brighter light and darker skin make them easier to wear – but it is the strong dark colours that particularly inspire. An attendant in one store described their new range as containing “jackets with a Neapolitan shoulder in the classic colours – blue, brown, green”. Green as a standard jacket colour? But there it was, in several stores – as an odd jacket, unlined, in a deep forest green (sometimes with white buttons). The combinations of colours were also strong. Every jacket displayed has a pocket handkerchief, with the pairings including brown/lilac, navy/mint and brown/sky blue. The handkerchief coming second in that list, of course. As reflected in my previous observation The Italian Background, there are more navy ties in Milan than any other colour. They are silk, wool and linen, plain, striped and spotted; but they are all navy. This allows greater adventure in jackets and suits – several men wore great tan-gabardine suits; I saw two purple-cashmere odd jackets; linen was often navy but surprisingly common. Equally, the pocket handkerchief was probably more likely to be bright and patterned than the tie. Other observations include fitted sweaters – even in old, conservative establishments the sweaters were short and slim at the waist (I recommend Red & Blue in particular). And the length of the rear blade of a tie is almost irrelevant compared to the length of the front, which must always finish at the top of the trousers – the back can be longer, tuck into the trousers or hang at the same length on its own. There are, of course, many badly dressed men in Milan. 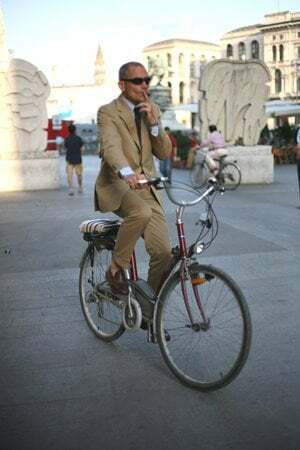 If the proportion of British men that I consider well-dressed (in my very personal, subjective taste) is one in fifty, in Milan it is one in ten. But that’s still a lot more inspiration. Look out for the next post, on recommended shops. You can follow the discussion on Observations from Milan by entering your email address in the box below. You will then receive an email every time a new comment is added. These will also contain a link to a page where you can stop the alerts, and remove all of your related data from the site. Rome: Papal aristocracy; more vulgar but far more italian. The government, liberi professionisti, and raiducal brits living there yield a unique, if not more classic British style…but it’s not as obvious as Milan. Naples: well… you can see some of the most elegant men in the world, but they look good in Naples. A rich decadent adventure, Naples is the most respective of British style. Sicily: Many of the best, most respected Italian tailors come from here…. Funny thing is…the British style seem to be the primary influence everywhere. I’ve never felt underdressed in any country I’ve visited. Until I got to Italy. And then I felt like I was in a hired suit. Simon, you seem to refer to a sweater manufacturer called ‘Red & Blue’. Of course, when I try to find them via google, all I get is pages of hits for sweaters in red and blue. Can you provide some more information about this manufacturer? I have a hard time finding light sweaters that fit well (i.e. short and slim). Thank you!